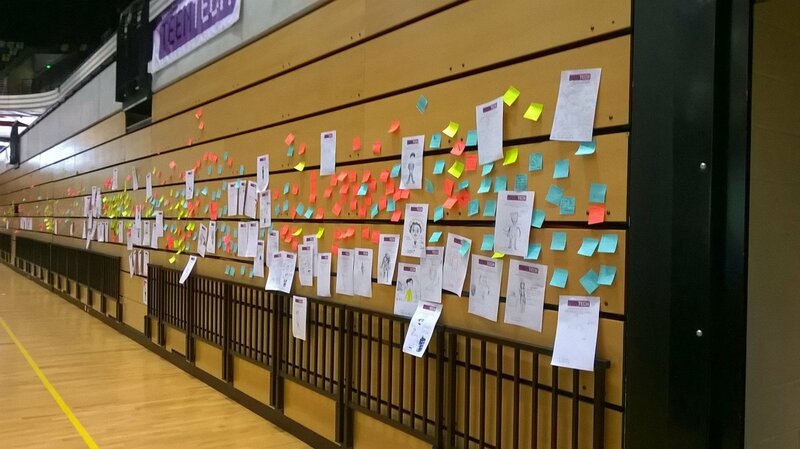 Students aged 12-14 expressed a need for more females in science, technology, engineering and maths (Stem) subjects during a recent TeenTech event. TeenTech held a science and technology event at the Copperbox in the Olympic Park, where scientists, engineers and technologists gathered to showcase Stem to more than 500 year eight and nine students from across London. Students took part in a variety of challenges throughout the day, including testing the DNA of strawberries and a food truck which takes ingredients and transforms them into never-been-seen dishes. Throughout the day, students were asked to come up with ideas to “make the world a better place by 2050” and post their ideas on a wall (pictured left). Messages included “There will be more female scientists in 2050” (Image 1) and “Women being completely equal in the workplace, sports, opportunities” (Image 2). Another student wrote “Change the way the media portrays women” (Image 3), while another wrote “More opportunities for females over a range of industries to promote equal rights” (Image 4). One student even wrote “No more sexism” (Image 5), and another said “Women get exactly the same opportunities as men” (Image 6). Research conducted by TeenTech found 29% of female students were initially interested in careers in Stem subjects, a figure which rose to 71% after they were exposed to what a career in Stem would entail. Students were also asked to draw their idea of a scientist, which encouragingly included a large number of pictures of females (Images 7, 8, 9, 10). The event was organised by TeenTech founder Maggie Philbin. Founded in 2008, by Philbin and Chris Dodson, the TeenTech organisation aims to help young people understand the opportunities available to them in the science, technology, engineering and mathematics workplace. TeenTech runs one-day events across the UK, offering hands-on exhibits and workshops from businesses and universities. Companies present at the London event included Activ Robots, Alstom,Atkins, City University, Cisco, JVC, London Transport, BMC, Sodexo, Maplins, Loughborough University, National Grid, Samsung, Softwire, Qualcomm, and QMUL. Other messages posted on the wall ranged from “A cure for cancer” to “Fingerprints instead of Oysters”. One student wrote “A water machine shipping water from here to Africa because it rains so much over here and it goes through water filters”, while another suggested “A medication sweet that cures you from any illness”. During the day, education organisation Technology Will Save Us ran workshops with "invention kits" to teach the students, in hands-on sessions, how to build gadgets to promote creation in all areas of working in the technology industry instead of just screen-based apps and games. Ideas created included an ear muffler for sound control in urban areas and sensors on home heating systems and door locks to update home owners when out of the house.